I cannot remember making spare ribs ever before, but I WILL be doing them again - they were SO tender and delicious and a visitor and myself ate them all quickly! I did them on the barbecue however you could also bake them if you wish. I actually did not measure the marinade for the spare ribs so just add what you think and taste before cooking. My quantities are suggested only! My friend made a typical Jewish "kugel" to go with this and which is a noodle dish. Cook noodles per packet instructions, then drain. Chop onions and cook till golden then cool. Beat egg and add to cream cheese in a large bowl. Add grated cheese and onions, and mix all well. Add salt, pepper and chives. Add noodles and mix all together. Place in a shallow casserole dish, and press it down so the mixture is dense. Scatter more grated cheese on top and bake till golden. Mix all the marinade ingredients together and pour this over the spare ribs, or dip them in the mixture. Put in the fridge for at least 8 hours or overnight. Turn the meat several times during this time. Drain the marinade and keep. Light the barbecue and turn down to low after about 5 minutes, or cook in a medium oven for about 50 - 60 minutes. Lightly grease the meat or the barbecue so it doesnt stick, and put on the heat. Cook for about 25 - 35 minutes as low as possible, turning a few times, and also basting with the marinade during cooking. Serve, either by cutting the ribs apart though I served them as they came and we pulled them apart - and they should be "melt in your mouth" delicious! I also served with a small side salad. 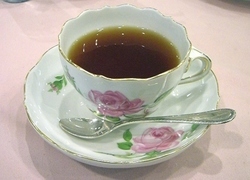 Do you prefer to drink tea out of a thin, china cup or does it not worry you which cup? Have you ever worked as a volunteer anywhere? 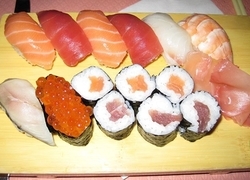 Where is your favourite Sushi place to eat? My apologies - you are quite right there.....however not all Jewish people, I believe, keep kosher. I have however removed it - thank you for pointing this out! I am very surprised you would be using Pork it's not a ' Kosher ' meat there are alternative cuts to use putting this recipe to Jewish recipes is hardly appropriate !